Fr. 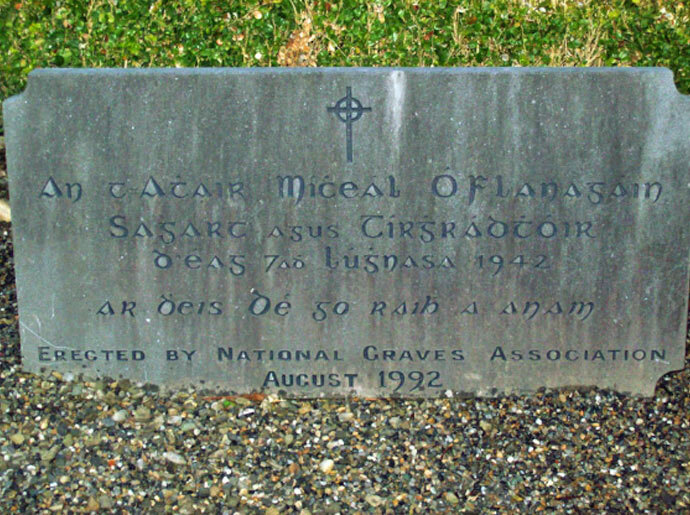 Michael O’Flanagan (1876 – 7 August 1942) was an Irish Republican and Roman Catholic priest. Born near Castlerea, County Roscommon, O’Flanagan’s parents were native Irish speakers. He received his primary education at Cloonboniffe N.S. before traveling to Sligo where he attended secondary school at Summerhill College. He graduated in 1894, and continued his education at St Patrick’s College, Maynooth where he was ordained for the Diocese of Elphin in 1900. After joining the priesthood he returned to Summerhill College where he was employed as a teacher until 1904. Vice-President of Sinn Fein from 1917, O’Flanagan had been chosen to recite the invocation at the first meeting of the newly proclaimed Dáil Éireann in January 1919. In 1927 he was suspended from clerical duties because of his nationalist activities.He was president of the then Sinn Féin from 1933 to 1935, when he was expelled from the party for participating in a Radio Éireann programme. He was one of the few Catholic priests to defend the Spanish Republic during the Spanish Civil War.